Looking back five years later, how did 9-11 change the news? 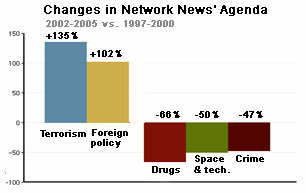 If the network evening news is any proxy, the attacks of September 11th 2001 in Washington and New York and the wars that resulted have led to increased coverage of foreign policy and global conflict on the network evening news, but less coverage of domestic issues, according to data from ADT Research’s Tyndall Report, which monitors those newscasts. The mix of traditional hard news and feature of lifestyle coverage, meanwhile, has remained virtually the same on the evening newscasts. Those are the findings drawn from examining the four years of network newscasts prior to 2001 (1997 to 2000) and the four years since (2002 through 2005) according to data generated for the Project for Excellence in Journalism by ADT Research, which publishes the Tyndall Report. The number of minutes devoted to coverage of foreign policy was up 102%, according to ADT’s data. Coverage of armed conflict rose 69%. Coverage of terrorism rose 135%. At the same time, there has been a serious decline in reporting about domestic issues. Coverage of crime and law enforcement dropped by half (47%). Science and technology coverage fell by half (50%). Coverage of issues involving alcohol, tobacco and drugs dropped 66%. A rise in foreign coverage may not surprise anyone. U.S. troops are currently fighting and dying in Iraq and Afghanistan. The issue of global terrorism is the new question of our times. It may dictate the outcome of the 2006 midterm elections and define the Bush presidency. What is less obvious is the effect of the shift in coverage on the overall tone of the newscast. For instance, the balance between reporting-driven “hard news” and softer features, interviews, and commentaries remained virtually unchanged after 9-11. The newscast minutes devoted to hard news increased by a mere 2 % in the years after the attacks while the airtime given to softer coverage decreased by only 5 %. Tyndall Report publisher Andrew Tyndall says his work — which monitored the ABC, CBS and NBC weeknight newscasts — suggests that it is events, rather than the journalists who cover them, that determine news content. “The big lesson is that we overstate the influence journalists have on the news agenda,” he says. Still, the network newscasts are a zero sum game, meaning that for every battleground or terror threat generating coverage, there is another story, in many cases a domestic one, going unreported. Following a period in which news organizations cut back on foreign bureaus and de-emphasized geopolitical coverage, the events of 9-11 have reinforced the old Cold War truism that the first responsibility of the nightly newscast is to determine whether our world is safe that day. The jump in minutes devoted to coverage of foreign policy, armed conflicts, and terrorism appears to be in sync with the concerns of citizens as measured in a Sept. 6 Pew Research Center for the People and the Press poll. In that survey, 51% of the respondents said the 9-11 attacks changed life in America in a major way and 82% considered the assault on the World Trade Center and Pentagon as serious as or more serious than the Dec. 7, 1941 attack on Pearl Harbor that brought the US into World War II. Tyndall accounts for some of this focus toward war and terror by arguing that Al Qaeda makes a more menacing and compelling national threat than crack cocaine or urban murder rates. Although subjects such as drugs and crime were the traditional ways of making people frightened, they are easily trumped by terrorism, he says. The apparent determination, however, to continue to showcase feature-style coverage even in times of war and terror was obvious on Katie Couric’s much-anticipated Sept. 5 debut as CBS anchor. After leading with a disquieting story about the resurgence of the Taliban in Afghanistan, the broadcast moved to an interview with columnist Tom Friedman, the first pictures of baby Suri Cruise, a soapbox-style speech by filmmaker Morgan Spurlock and a heart-warming story about Nicaraguan orphans. * DC Bureau includes stories with correspondents reporting from the White House, Capitol Hill, Pentagon, DoJ, State Dept., Supreme Court etc.